It’s hard to believe that we’re heading into the last part of the school year. Math Day was so fantastic, and afterwards I had the chance to reflect on how much the students in Turquesa have learned and grown this year. It is truly turning into a remarkable year. There is a sense of ease, focus and maturity in the room these days; this is a hard-earned cultural climate in the Upper Elementary. By that I mean that as a teaching team working in collaboration with children, we know that the entire community must strive together to achieve this. One of the paths toward this sense of communal well-being is a culture of shared appreciation and acknowledgements. This was so evident to me last week at Math Day. Children were not only confident and proud of themselves; they were proud of each other, and excited to teach and learn from each other. I saw it again yesterday afternoon, too. We spent the morning on ITBS, then had a history/art lesson about illuminated letters. After recess, we continued the lesson with a video about how to create an illuminated letter (link). The entire class then sat together for almost an hour, while everyone happily drew, erased, measured, experimented, shared, congratulated, and offered encouragement and feedback. The entire class! They were working hard, each on their own, but simultaneously together. If this is a glimpse of their future lives and work, I think the world will be in good hands and Dr. Montessori would be proud. Happy February! Thank you so much for joining us last week at conferences. We really enjoyed our time with you, and we deeply appreciate the spirit of collaboration and partnership! We hope you enjoyed our Hands-On Science Day at the end of January. The students were so proud and excited to share their work with you. As teachers, we were pleased to see the high level of thinking and observation that led children to their conclusions. And there were so many cool scientific gadgets supported by so many precise and thorough data tables...really fantastic! In history studies, we've been learning about the Golden Age of Islam and medieval Islamic culture. The students are particularly enraptured by art, science, architecture and city life. Ms. Michelle has been focusing on geometric Islamic art, as well. During the middle ages, incredible amounts of math, astronomy, optics, medicine were discovered and it has been really wonderful to explore this era of history. We are excited to be welcoming Sandy and Tarek, two visitors from the Muslim Association of Puget Sound (MAPS, here in Redmond near Whole Foods) this morning in Turquesa. The students are eager to learn more about what Muslims believe and the basic tenets of Islam, as well as answering the students' growing list of questions. This week, we’re shifting our focus to Imperial China. As part of our studies, we’ll be preparing (and enjoying!) a feast of dumplings to celebrate the Spring Festival (Lunar New Year). History is going to get really delicious! During small group Geography lessons this week, students have become oceanologists and mapped "hidden terrain" by charting depth levels of a moulded Sculpty terrain in a box hidden underneath a piece of paper. Keep an eye out for photos on Bloomz soon. Next week is Valentine’s Day. We’ll be celebrating on Wednesday. We had an extensive all-class discussion about how to celebrate. The community decided to follow tradition and add a new twist. First, students are invited to bring individual cards for each of their classmates. They do not have to bring cards; they will still receive lots of cards from classmates whether or not they bring them. We have 18 students in Turquesa. The students agree that it is really meaningful when they receive hand-made cards, and that they like it when everyone receives similar size cards. We do not pass out candy or toys. We are also planning to share our caring community spirit beyond the Elementary community by making and passing out hand-made cards to families and staff in the EC and I/T Programs. We've been busy here in Turquesa these past couple weeks! Our biggest endeavor that the students conquered this month were their Invading Forces Project. Each student did extensive research on a group of people they chose that were involved in the end of the Western Roman Empire. People studied Vikings, Celts, Goths, Huns and more. After researching, we had a whole series of lessons on how create PowerPoints that are effective, organized and helpful during a presentation. Students shared their PowerPoint drafts with each other in small groups, got lots of great feedback and made major revisions and edits. They also supported their classmates by giving feedback, and thinking critically about what makes a great presentation. Each person wrote out detailed presentation notes, as well. Last week, we spent almost three hours watching students present! If you haven't yet, please ask your child to give their presentation to you and ask them lots of questions. It is truly remarkable to watch a community of children work so hard, learn so much and be so supportive of each other. They were attentive and engaged at each others' presentations, and they seem to deeply value each other's work and ideas. As teachers, we were both proud and amazed to witness the individual maturity and community cohesion. What an honor! A lot of Math Lessons have been happening recently and many students are moving along quickly through multiples, pre-algebra, factors, fractions, and decimals. In Geometry Ms. Nicole has been teaching how to understand area of various geometric shapes. Some students who were in a group discovering area of a parallelogram were amazed when they discovered how you can slice off the angle and move it to create a rectangle. In other academic news, during Informal Writing we have been visiting the power of voice in writing and storytelling and how to develop a character's voice to be unique. In Geography, students who hadn't had a chance to do a mini-island and colored key to finalize their work on land and water forms have been finishing those up as well. Our science lessons have perked up many of our students this year especially when it comes to air pressure and weather. Students have really enjoyed our lessons that we have been staying a little longer on the subject of air pressure and weather so we can dig deeper into the science. In the past couple weeks we taught how air pressure has a stronger force than water using the trick of filling a glass full, placing a piece of heavy card stock on the top of the glass, and flipping it upside down. We explored how air expands and contracts in the heat and cold by putting a balloon over the mouth of a water bottle and freezing it, and then putting the bottle in hot water. ​We created a couple different versions of handmade barometers to measure air pressure and talked about weather fronts and wind. Last week we explored clouds and made different kinds of clouds with meringue. It was a new experience for many kids and a very memorable lesson! Last Monday we introduced the new Invading Forces project for History. Students chose an invading force to research this week and do some pre-writing on their histories. Students chose groups like the Vikings, the Celts, the Goths, and several other groups. A bulk of the work last week involved researching and reflecting on the lives of these cultures. Students have been researching a page worth of notes on each of the following topics for their culture: Art, Religion & Death, Daily Life, Leaders, Dress & Ornament, Tools & Technology, Warfare, and a general "Others" page. Students are recording their notes using what's called a "Double Duty" log. They are writing their facts and notes on the left-hand side while they reflect about their own thoughts and opinions about the fact on the right hand side. Students will finish up their Pre-Writing Research early next week and will move into their draft writing portion. During Informal Writing we talked about fact-based vs opinion-based writing. We discussed how much of the written history of many civilizations was written by the Romans which led to questioning whether certain writings had a bias of their opinion put in them. This was to lead into our History Project writing proponent. In Geometry, 4th Years worked on Equivalence with Hexagons and a few others worked on either Area of a Triangle or Area of a Rectangle. For one group, Ms. Nicole taught a grammar lesson on compound predicates while others worked on Common and Proper noun work. The 6th Years will be presenting the first chunk of their Island Projects tomorrow to the class. They have been working everyday with each other to help finish their Nearest Neighbor reports and their basic Island Information for the presentation. Communicating with children can be hard! It’s important to lay a solid foundation throughout the Elementary years in order to be an in-touch, supportive, responsive parent who is raising a responsible, confident, healthy child. Join Ms. Nicole, Elementary Program Director in a lively discussion about how to have real, authentic conversations with your child. Please bring your questions, challenges and suggestions. We’ll provide hand-outs and other suggested resources, refreshments and coffee. We hope you have a nice week and enjoy the sun. Have a fun, happy, and safe Halloween! After starting out the month at Islandwood, it felt really wonderful to be back in the swing of things. We finished up our historical period of the Roman empire with lessons on the rise of Christianity and Emperor Constantine of Rome. We also started talking about religions of the world and the role they play in history. This week, students chose a religion to do some basic research on. They learned about the history and development of the religion as well as the basic belief structure and holidays. Our hearts warmed with a special campfire-like glow this week. We felt the sweet sound of beautiful story leads dance into our ears this week during Informal Writing. We are moving students to go beyond "Once Upon A Time" to instead start a story off with sensations and descriptive words. In Grammar, 4th grade students had a lesson on common and proper nouns; ask them about the bill/Bill story! 5th Graders are working on compound predicates and compound direct objects. Geography was a fun and popular lesson this week that involved hands on creations of mini-islands to model and label land and water forms they've been studying. They used Sculpey to create mini-islands and have been creating a map key and outline on paper to accomodate the island. This was a fun way to apply concepts that students have been learning about this year. The 6th Years have decided to have daily meetings at 10 AM to work together on their Island Projects. They are currently working on their Nearest Neighbor reports and have been working on creating a ceramic model of their island. Many geography components will be emerging next week! We have finished our Lesson 3 test in Wordly Wise today. Next Thursday we will meet and correct Lesson 4 activities A-D.
Ms. Nicole has been giving Geometry lessons on either Nomenclature of Polygons, Area of a Triangle and/or Equivalence with triangles. Scholastic packets went out today and the children had fun choosing which catalogs they wanted to bring home. Scholastic orders are due back 10/31 (Halloween!). Picture day is October 30th, 2017 for Turquesa. Just a friendly reminder that there are no costumes allowed at school on Halloween, but we fully encourage costumes at Harvest Fest! Harvest Fest is October 28th! This is one our favorite events of the year at MCH. It's always a ton of fun and there are SO many activities, games, and things to do. Keep an eye out on Bloomz for photos soon! We've had a busy month full of new lessons, history projects, and settling into new routines. There are also some exciting plans coming up! 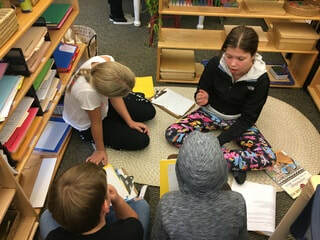 Students had individual meetings with Ms. Nicole and set up a plan for their math lessons and getting their math binders and record-keeping in order. History Projects on ancient Roman technologies has been forging ahead with great momentum. The students worked hard on building their models. In our History lessons, we have been telling the story of Rome vs. Carthage and students have really been enjoying learning about the Punic wars. Our first test with Wordly Wise went well and new students are learning the ropes for it. We also have several 5th years who have decided to forge ahead of the pace and have been working ahead. 6th Years finalized their island locations and have been having meetings with all of the teachers throughout these steps. And in EXTRA BIG NEWS, I will be leading our first ever Yearbook Club! For the first time, students will be in charge of designing and compiling the yearbook. Each student in the club will get a free yearbook at the end of the year. Read the newsletter for more information. The past couple weeks have been BUSY, but we have survived! We have finished our Literature Circles for the year and students really enjoyed their last round of books. Students will now start reflecting on their Literature Circle work and select pieces for their portfolio. In History, students have finished their Ancient Greek Biographies and we enjoyed seeing the enthusiasm and costumes that students brought. They also had fun creating speeches as either Plebians or Patricians and they held a debate to convince why or why not one lifestyle was better than the other. We are now venturing into Roman history as we prepare for our Greco-Roman Feast this Thursday. In Geometry students have been working with measuring angles and area, or they've been working on surface area and volume of a rectangular prism. We also introduced students to Roman Numerals and our Roman Numeral Hundreds Board work. Individual math lessons have been ongo ing and have progressed nicely. A lot of work has been going on with fractions with many Turquesa students. We had an author of a children's chapter book series come to Turquesa twice as he sat down with students and held editing sessions with kids. The students have been helping him edit chapters in a book that will be published next year. This month has turned into a furry of finishing up Choice Book Projects before the end of the year. Ms. Alyx has sat down with each student and has scheduled each step of remaining Choice Book Projects in order to help students finish in time. Our beach day was a success! When we were at Golden Gardens it was a period of extreme low tide where the tide level was almost 15' below the highest water line. The Seattle Aquarium had Beach Naturalists at the beach who were there to help be guides for whoever was there. We learned so much about the marine life there! Last week we had a visit to Aegis last week and students helped make an art project with the residents. This has been a wonderful partnership that has been very meaningful. Out 6th years presented their year long thesis Island Projects. The students have worked very hard on these and the night was a success. The 6th Year is a powerful Year for the Montessori student full of unique and extensive learning. The Greco-Roman feast is THIS THURSDAY, so mark it in your calendar now. See you then! We are enjoying spring in Turquesa! Have you had a chance to see our new pollinator garden? The students have been helping to build retaining walls and moving soil. Soon, we be planting apple trees, blueberry bushes and native plants as well as seeding the grass path. Very soon, we'll be able to enjoy our new garden along with the bumble bees and birds! In other news, we are in the middle of our ancient Greek history projects. Each student has chosen a person - either historical or mythology - from ancient Greece and is writing a biography. It is remarkable to watch the level of expertise, comfort and mastery over the process of researching. Students began writing their drafts last week; others will begin this week. This project culminates on May 19 with each child in costume, giving a speech as their subject. The costume will be created at home in the coming weeks. We'll provide more information soon about that process. In science, we have had a fantastic time with our physic sciences this year and are excited to turn our attention to life sciences. This began last week with a lesson about evolution and Charles Darwin, and will quickly proceed to in-depth explorations of plants and animals. In a recent class meeting, we asked the students to tell us about their life sciences preferences and whether botany or zoology is more intriguing. The vast majority of children talked about how they wanted to do both! So we are going to be doing two science lessons a week for the rest of the school year. Children can opt-in to one lesson or both. This week we'll be having our third FLASH lesson. So far, we've introduced the curriculum, set ground rules, and had the lesson on families. One of the aspects of FLASH that is always so wonderful is the gradual entry into topics that are more intense. We are building our understanding of sexual health in a step-by-step way. On the afternoons of June 5 and June 6, we have a special guest i nstructor named Crystal Sharp joining us to lead two 90-minute sessions about puberty. Please put this on your calendar so that your child will definitely be at school. The children have decided to add a going-out to this month's schedule. It's a trip to see Midsummer Night's Dream by the Seattle Shakespeare Company! Every child in the class has decided to join the going out. We are going to produce our own musical version of the play next year, and lots of kids want to experience it first-hand in Shakespeare's language while they have the chance. More details will be coming to you soon about this trip. Since it's a going out, a committee of students is managing the communications and logistics for the trip. P.S. Turquesa had a great opportunity to go to Aegis assisted living center last week. Students helped plant strawberries, read books to the residents, do puzzles with them, and we had the opportunity to participate in a musical activity where they played bells together. P.P.S. UW Engineering Discovery Days rocked! It was huge and we learned so much about all forms of Engineering and physics. I've had a few technical glitches with Bloomz the last few times I tried to post, but it's working now! I wanted to give a short update on everything going on in Turquesa. We are starting ITBS testing this week and it will happen the morning of Monday through Wednesday. We had our practice test on Friday and the students did great with understanding procedure and enjoyed the frequent breaks. Please make sure kids had a breakfast with protein that will power them through the morning. In History we have been going over Ancient Greek history that will go into Roman history. We covered everything from the Oracle at Delphi to the Peloponnesian war. Students are also starting their Ancient Greek Biography projects that they will present May 19th. This will be using the formal writing process with steps broken down into weekly due dates. Students have also started working in the garden with Ms. Katherine once a week. She has enjoyed setting up the garden with them and planning out this harvest. The Science Exhibition was a huge success! Students really felt a sense of pride in their work and we wouldn't have been able to do it without the support that parents offered. So, THANK YOU! Our next topics in science will be Life Sciences started next week. This Friday is our Engineering Discovery Days at UW and students will be immersed in graduate level science and engineering projects. There will be no Spelling and no Wordly Wise this week.